Today at kindergarten we had some exciting ways to paint that some of our children have not explored before. 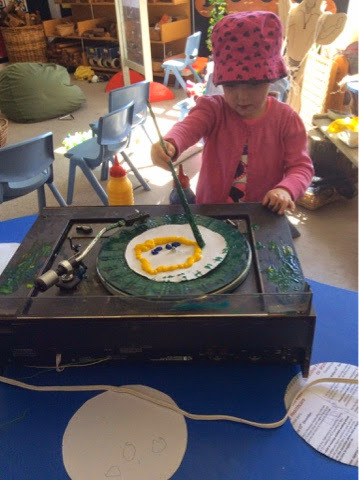 Inside Ashleigh set up the record player, some round paper and two bottles of paint on a table. When the children started arriving they were very interested in what this machine was and what it was going to be used for. As children managed their impulsivity as they waited for a turn parents and the children explored what the record player originally was used for, some saying it was for big CDs to go on, there was mention of how that is how parents used to listen to their music, the children thought this was very funny. Outside the exploration continued with some children exploring painting ice. 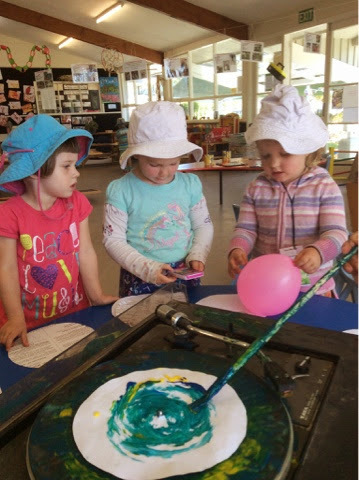 They were very interested in how the paint looked and what happened to the colours as they painted the ice and it began to melt. 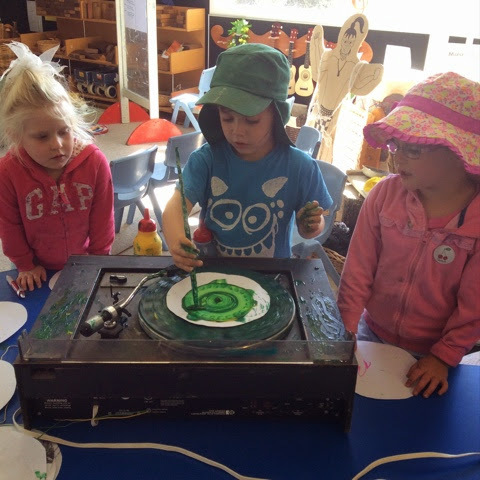 The children spent a period of time exploring painting the holes and cavities that formed as the ice melted. Ben shared "we are exploring" as the painted different colours onto the last small bits of ice. 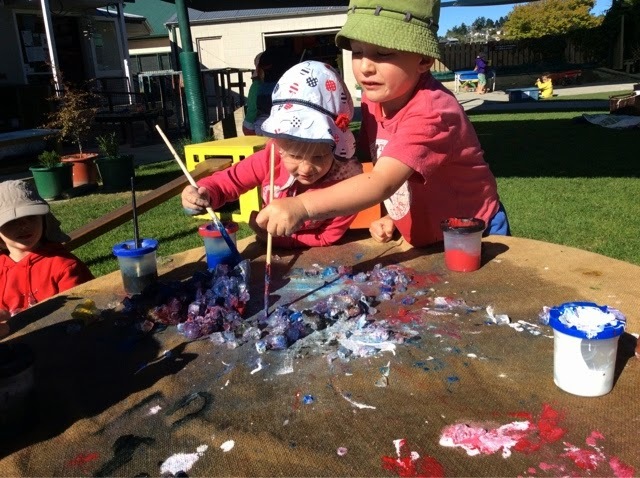 What fantastic fun was had as the children explored different ways to paint. 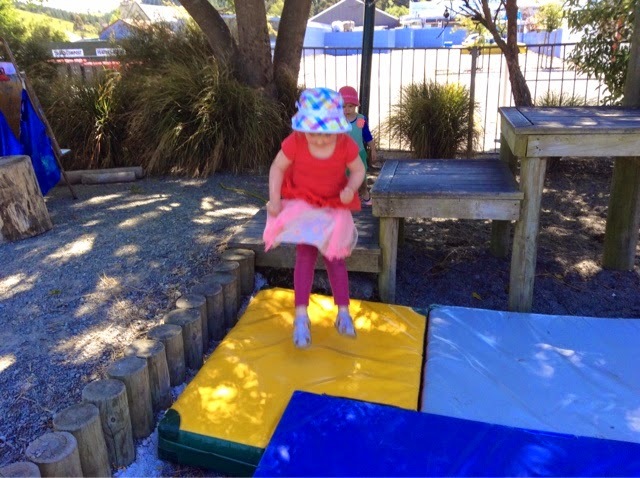 Today some of our afternoon children spend a period of time testing out their jumping skills, with some purposeful placing of mats below steps, that we know the children love jumping of. 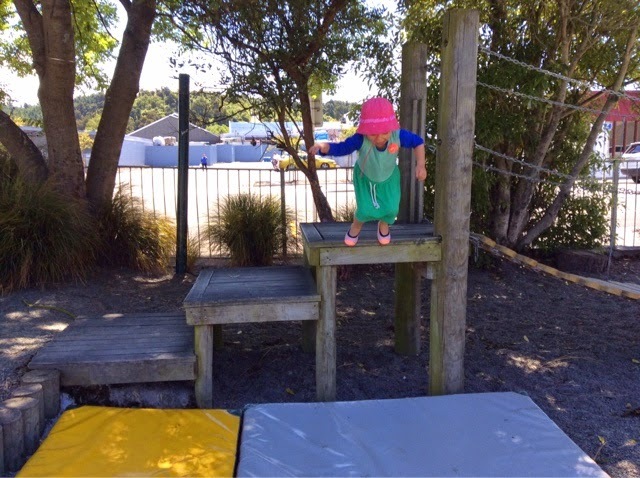 We started our risk taking by jumping off the smallest step of them all, as we worked together on our safety skills we talked alot about waiting for the child who has just jumped to move off the mat. 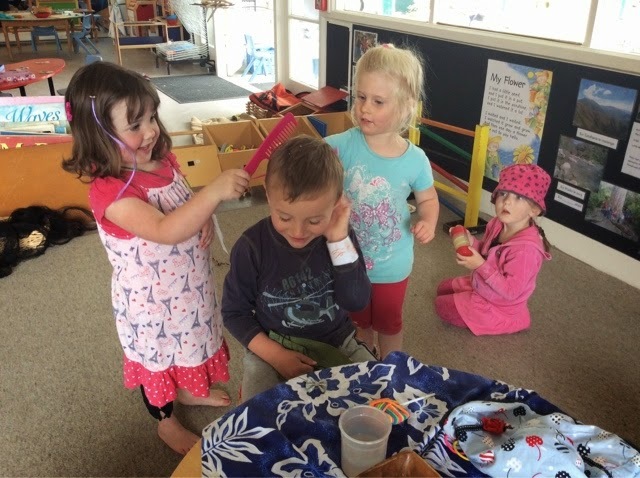 Showing manaakitanga/ care and respect for our friends is highly respected here at kindergarten, and we were fantastic at practicing this skill. 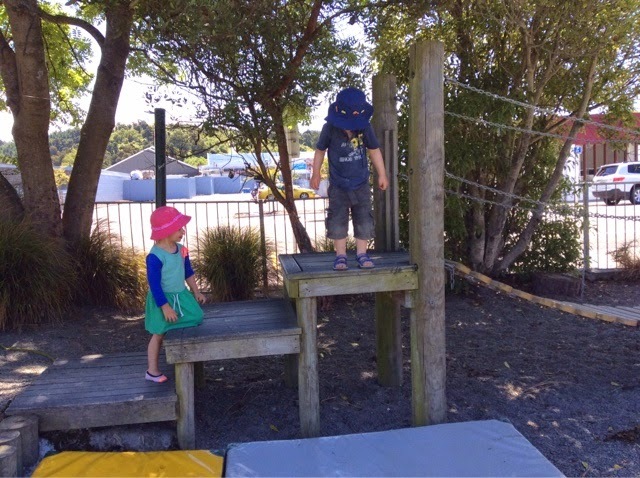 After jumping off the bottom step a few of our children decided they would take a risk and jump from our middle step, some got up on the step and decided it was a little bit high, others took a responsible risk and jumped down. 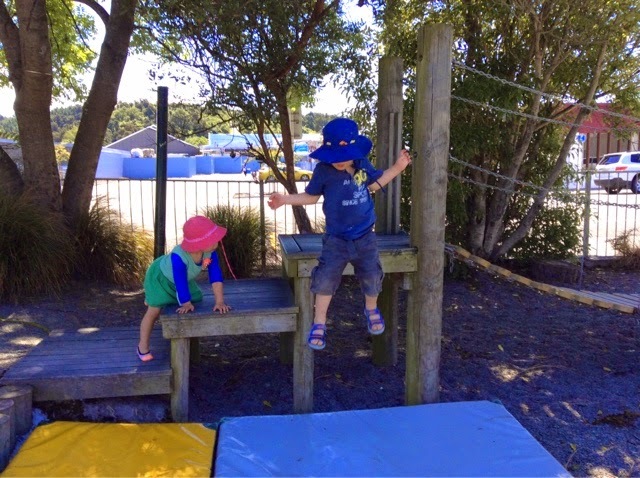 After lots of practicing it was exciting to see some of our children take an even bigger risk, climbing to the highest step to challenge their own skills to see if they could safely jump from here onto the mat below! Kātahi nā te tamaiti mōhio, ko koE, what a clever child you are. 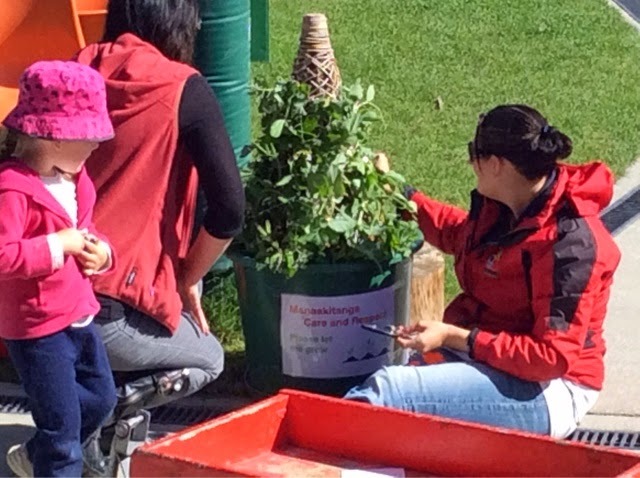 Toia te waka – mahia te mahi, be actively involved, and the children in afternoon kindergarten were actively involved in taking risks this afternoon. Ka pai, well done. 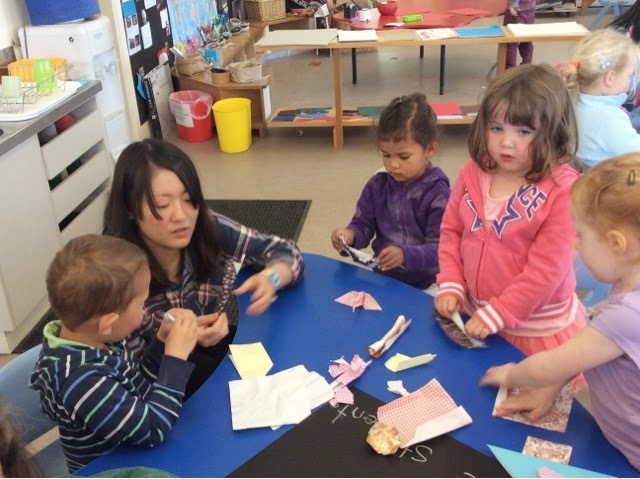 Our children have been showing an interest in making planes with paper. To extend this interest and explore another culture we invited some Japanese students from the high school , to share other creative ways of folding paper .. Origami. We had to really persevere and strive for accuracy as we carefully followed the steps. It was also fun to explore our own ideas and create our own origami designs like Hanna's candle. He tino auaha tenei , this is very creative! This afternoon Tash, Maddie's mum, came in to do some baking. 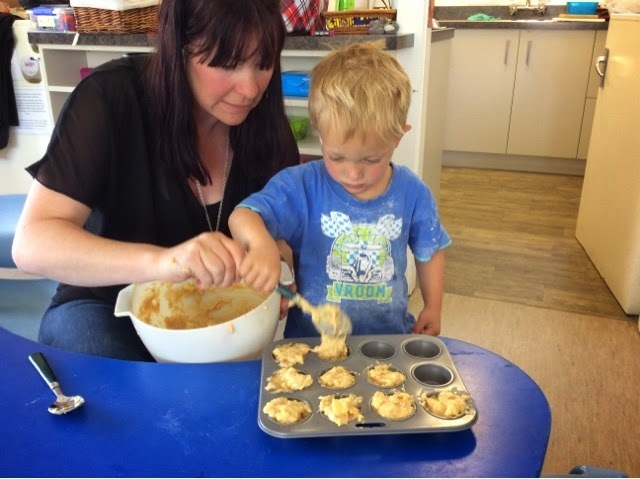 Numeracy and literacy skills were put to the test as the recipe was written out. 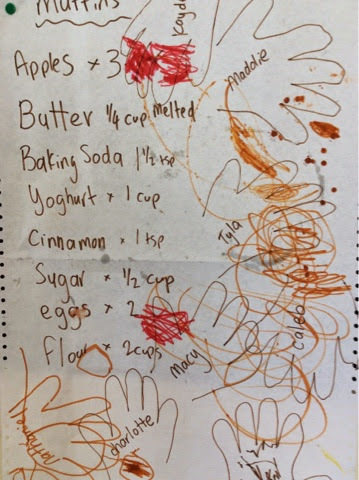 Then the children drew around their hands as a reminder to wash them/ horoi o ringa ringa, before they started baking. That’s good thinking, he pai koe ki te whakaaro pena. 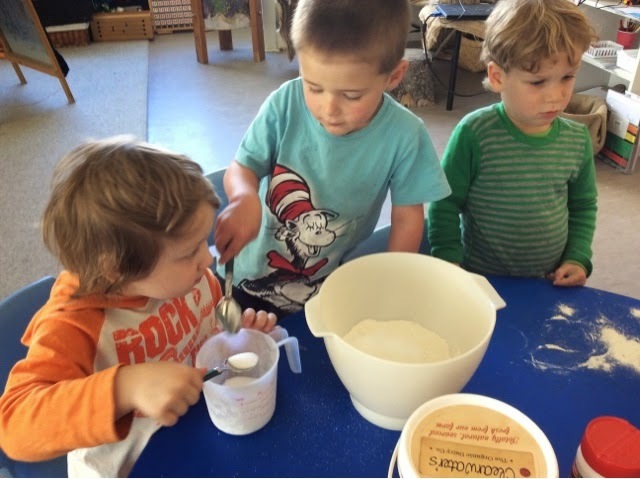 Then the tamariki worked interdependently to mix the ingredients together. 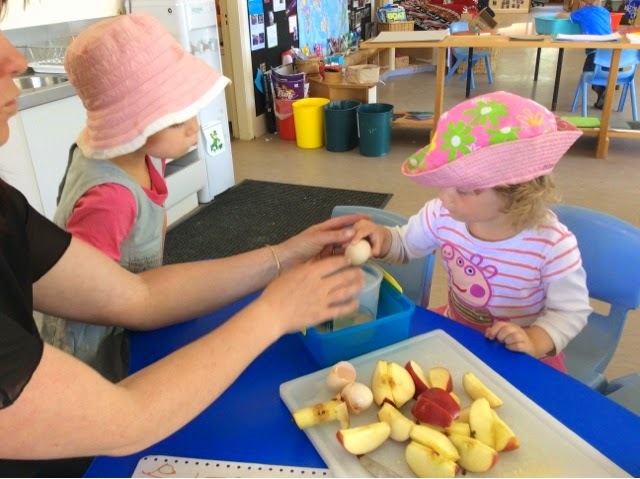 Great turn taking, sharing and managing their impulsivity was seen happening around the busy table. 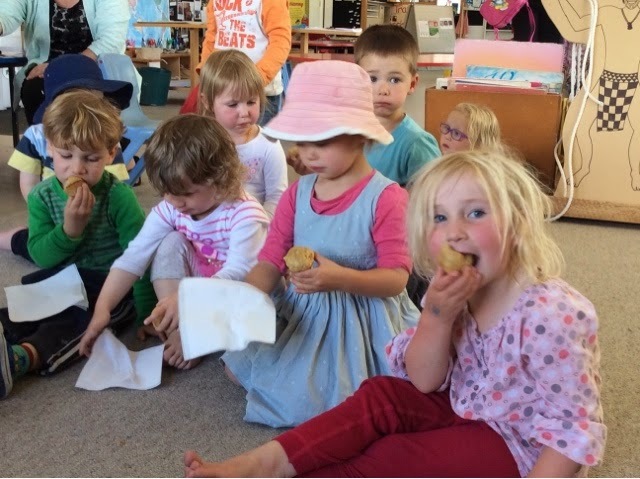 Then finally, we tasted the yummy apple muffins at mat time while listening to a story. 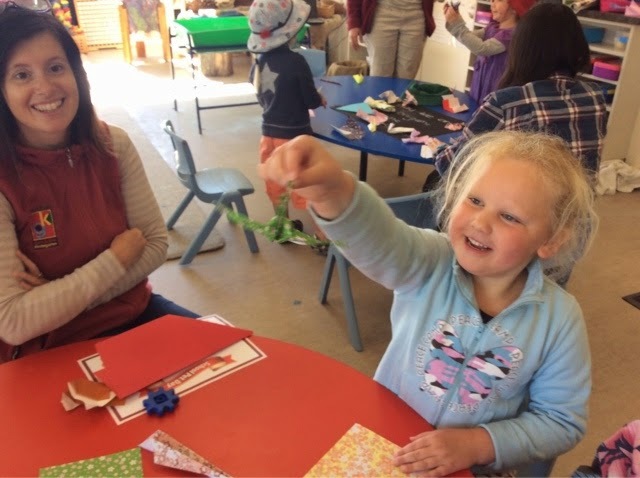 It was wonderful to see so many children enjoy in the proces and be actively involved/ mahia te mahi. 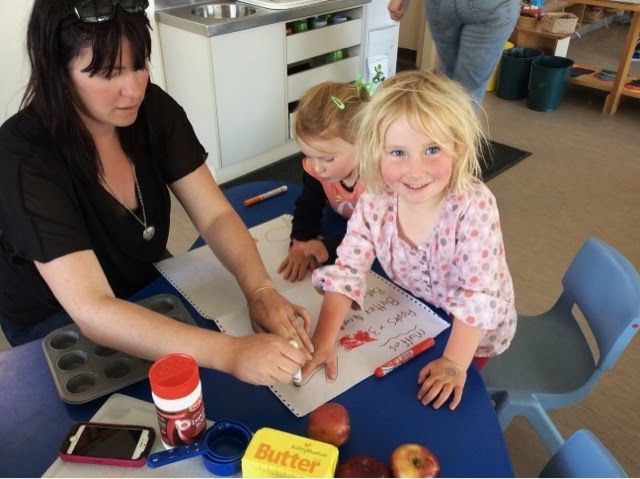 We apprecitte whānau coming in and spending time at Kindergarten. This supports our core value of whanaungatanga/relationships. 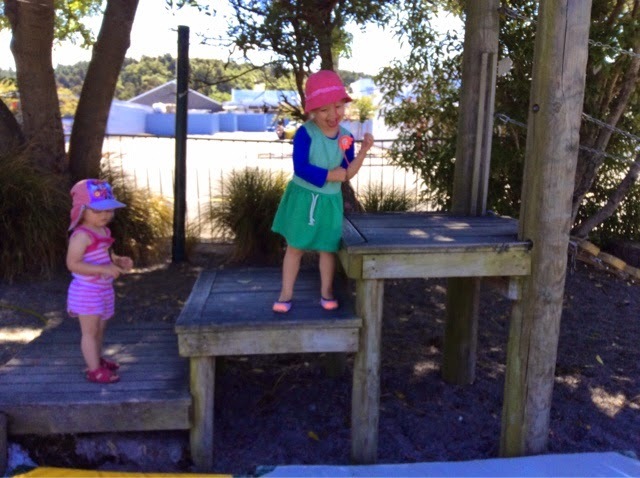 Creating interesting play spaces for children is important to engage their imaginations. From this, the outcomes for chidren are limitless. 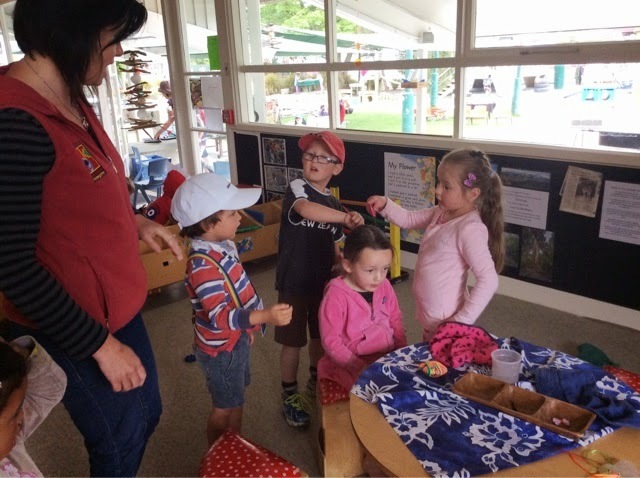 As teachers, we can either provide activites that have provocation, such as hair dressing tools or are open ended and are an inviaton to play. While we are mainly driven by children's interests, sometimes we add our own ideas or provocation to see where the children will take them. Ka nui ake to matauranga, your knowledge increases. Today, two great examples of each type of activity occured. This morning, we had some great donations of hair accessories that came from a discussion with a teacher. 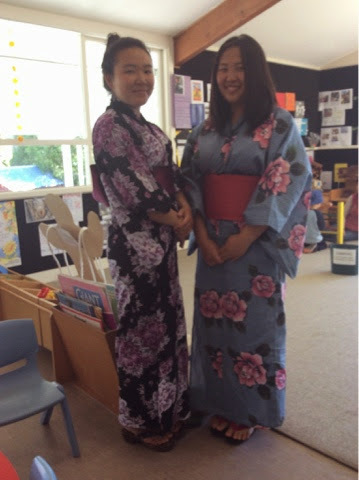 This led into some wonderful role play and rich language experiences. Some Habits of Mind came into practice. Working interdependently to do some ones hair, persisting and problem solving with the tricky hairclips and having empathy to share and make sure there were enough items for everyone. We will keep these resources out and see what follows and what further plans the children continue with over time. 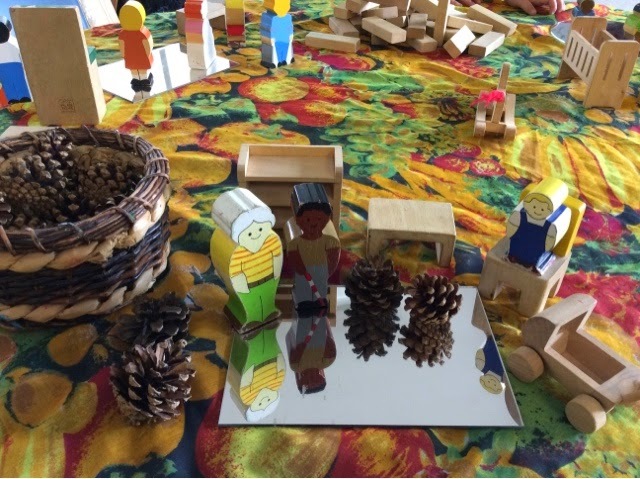 In the afternoon, we set up open ended resources in appealing manner to create an invitation to play. This was well received. 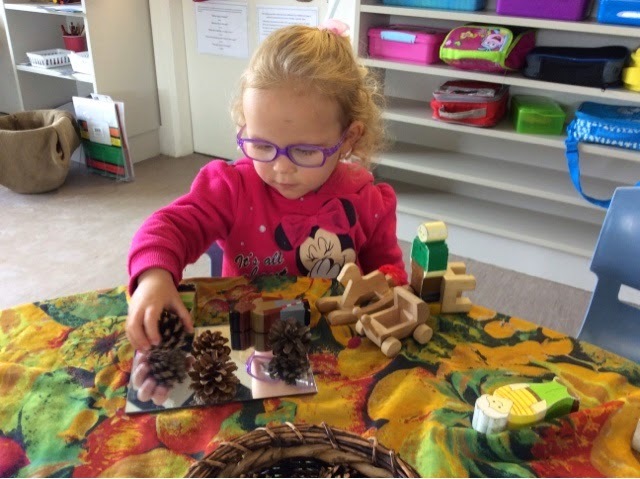 The mirrors added another dimension and created some curiosity and some oportunities for questioning and problem solving. These are simple activities that you can easily set up at home too! 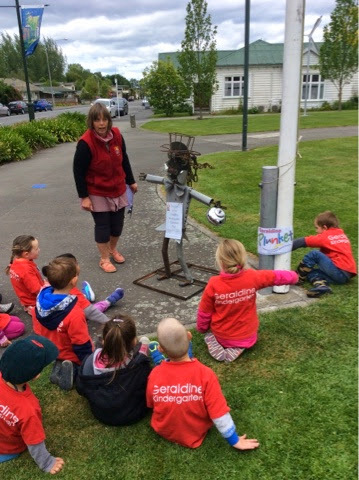 The community has supported the Kindergarten again with some amazing scarecrows around the town. We were able to find some of them and had to look for clues to work out who they were! But the favorite was Elsa from Frozen and the children knew Mickey of course. When Abigail saw Minnie and Donald in the window she made up her own name for them, "It's Minnie Duck!" It's so much fun to play with words and be so creative! Ataahua! Fairy Grotto in the making! The seeds wer planted and the stalks and leaves are now providing the foliage for our Fairy Grotto. The grotto has been planned and constructed together by Heather. But there have been many fairies who have contributed. The children have made many little items that have been specifically placed and Ben constructed the door. Gael creatively made the fairies and all these are for everyone to find when they visit the Geraldine Primary School during the weekend. Experience the awe and wonderment as you find the clever little items that hide amongst the leaves! 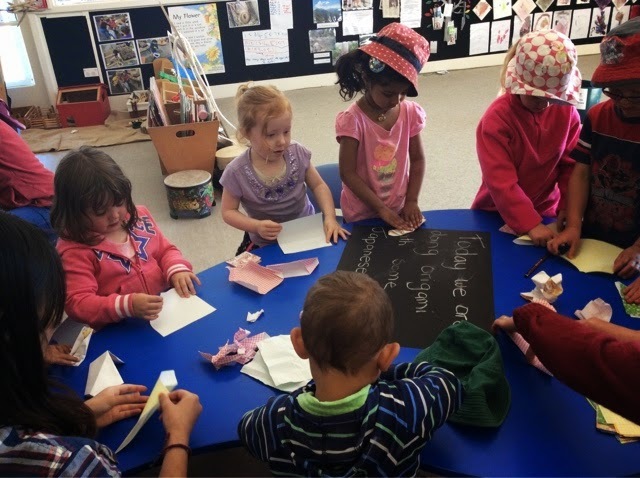 Tu meke tamariki - clever children! 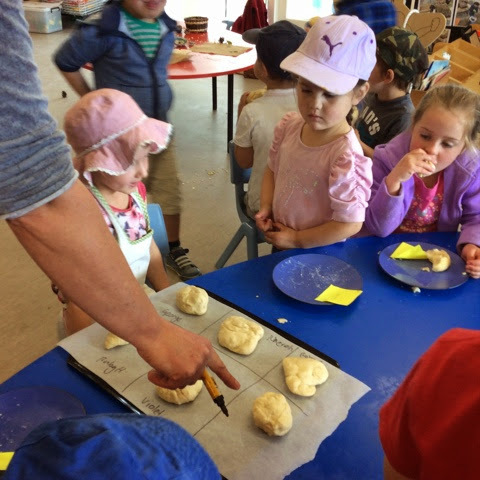 Last week a group of children visited the supermarket bakery and it was great to revisit the activity to make some dough and bake it in the bread machine that Janet (EC Student) brought from home. 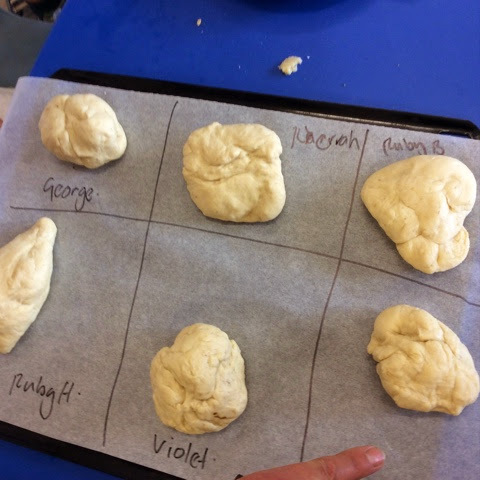 Very cleverly, Janet made a grid on the cooking paper and placed the prepared dough on each one. Janet smiled when she said that it helped her to remember whose was who's. Great strategy! 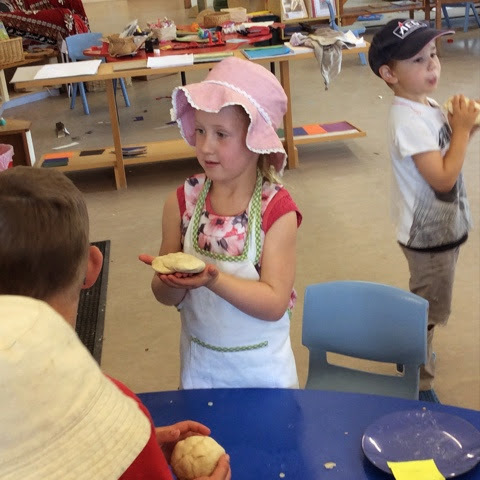 It was overwhelming at the beginning as a lot of the children that went on the visit returned to particpate in the dough making experience. But even children like Kherrah, who was having her first morning at kindergarten, smelt the smells and came investigating! Kherrah made her own bun too! 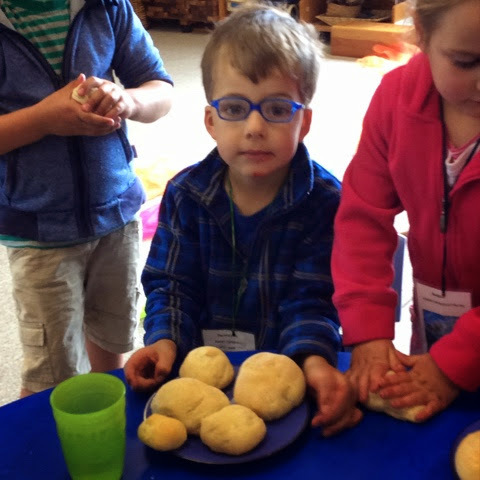 Mason contributed by making the most and then shared the bread with others - ka pai mo to mahi! Great work! Last night was our family/whānau picnic. A time for children to bring their families to Kindergarten, especially those that don't get to come very often and spend some time in this special place. 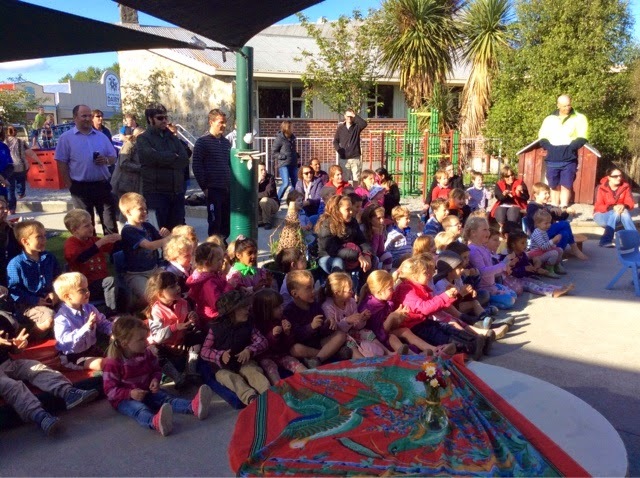 A great oppotrunity to whanaungatanga/relationships to be strengthened between our whole Kindergarten community - he iti kahurangi/a little treasure! 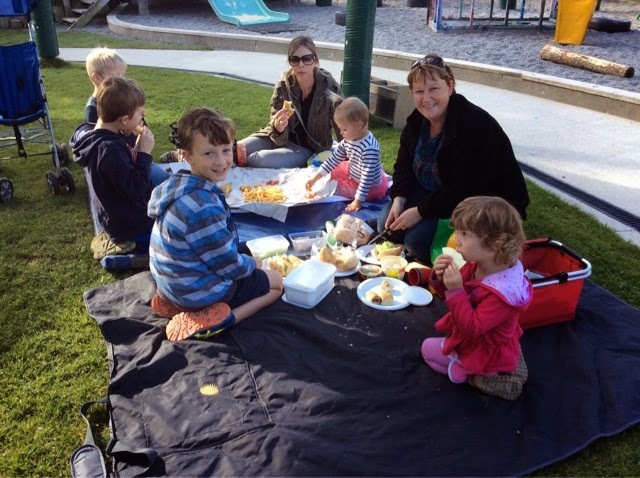 Some children enjoyed sharing with their older siblings the fun places they like to play and others enjoyed eating their picnic dinner and chatting with new friends. We were so lucky to have Melanie Poppin's the magician come to visit us again! 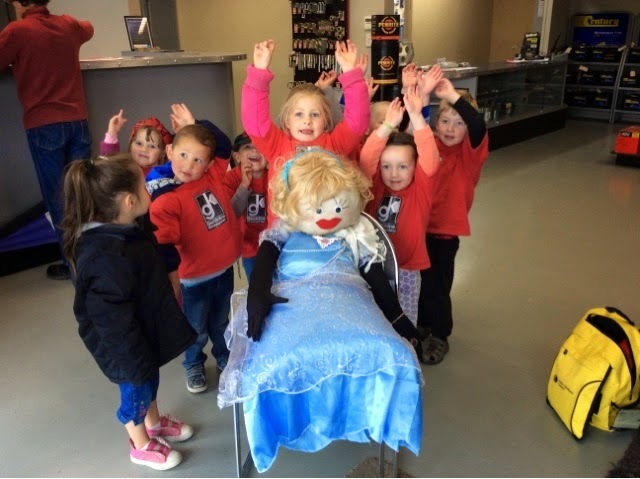 The children absolutely loved having her here, the sound of laughter filled the air. This morning a small group of children found something growing in the vegetable garden. They weren't sure what it was, so curiosity got the better of them and together they pulled out 3. But what were they? They are a root vegetable, that has a big green bushy top. George thought they were parsnips and he said to Louise "You need to cook them or else they'll taste yucky.... I've cooked them and they taste yum". "mum has radishes white, so they must be radishes.... ow they taste hot" she added. 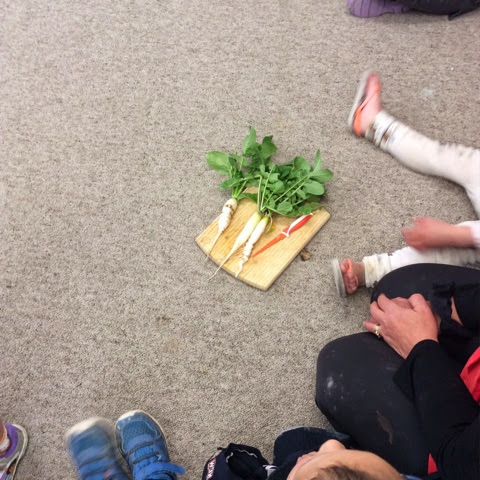 So after some brave children who took a responsible risk along with teachers, we discovered that they were white radishes that were rather long, not round like the ones we have eaten from our garden earlier in the week! Ka nui ake to matauranga - Your knowledge increases. What great problem solving the children did as they shared their ideas about what they could be, before tasting to find out exactly what they were. 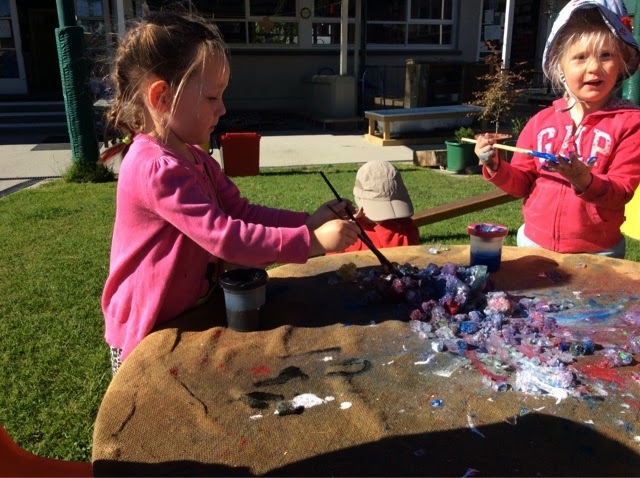 Recently teachers have become really aware of ephemeral art happening around the Kindergarten since Tracey returned from the NZK conference and shared her learning around this type of art. Ephemeral art is a creation that is transitory and exists only breifly. 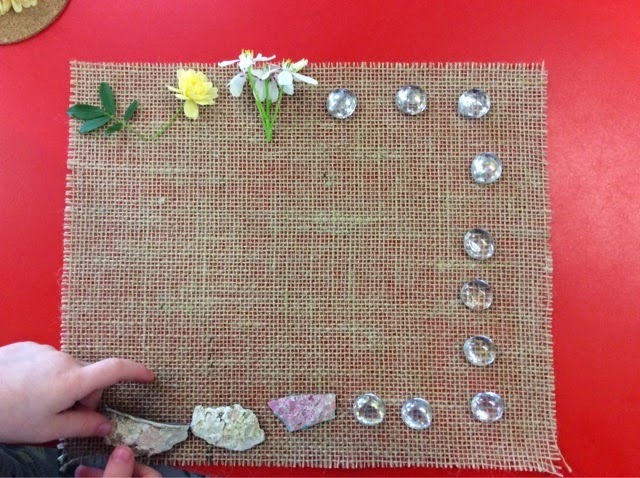 Above is an example of Ruby's art, where she removed some sea shells to create another brief piece of art work. 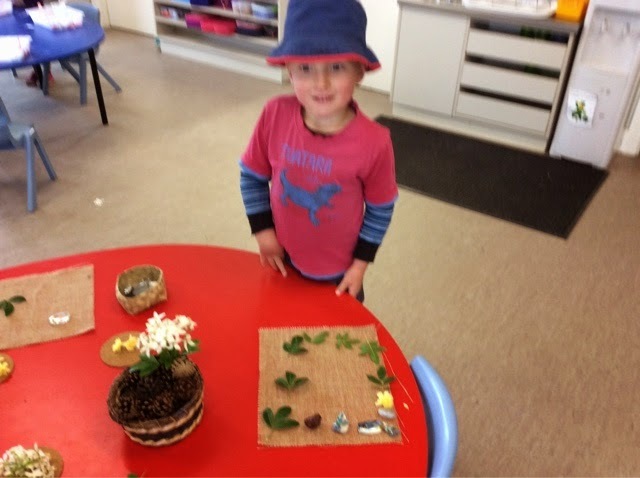 Throughout our Kindergarten environment we have a varity of natural resources for children to use in their play. 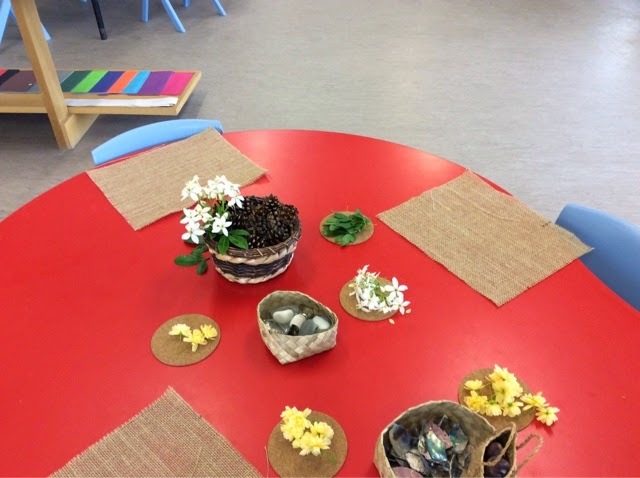 Teachers have been setting up tables with lots of different natural resources and different presenting surfaces for children to freely explore the possibilites of ephemeral art. 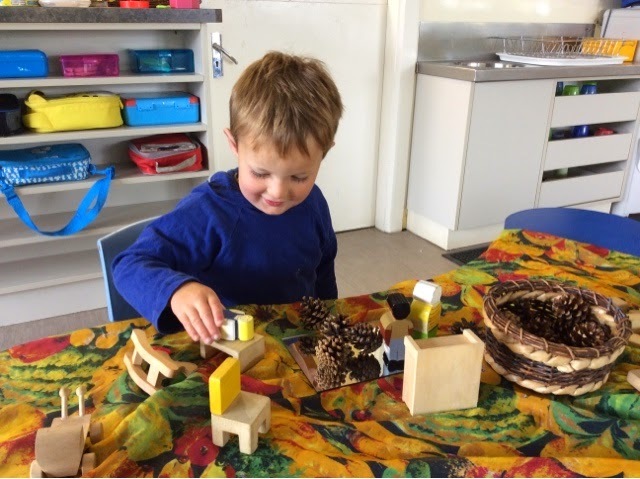 Children work very carefully as they place the different natural materials on to their work surface, demonstrating wonderful creativity! Tino pai rawa atu - absolutely awesome. I am sure you will agree that the piece of art that the children are creating are just that, awesome! 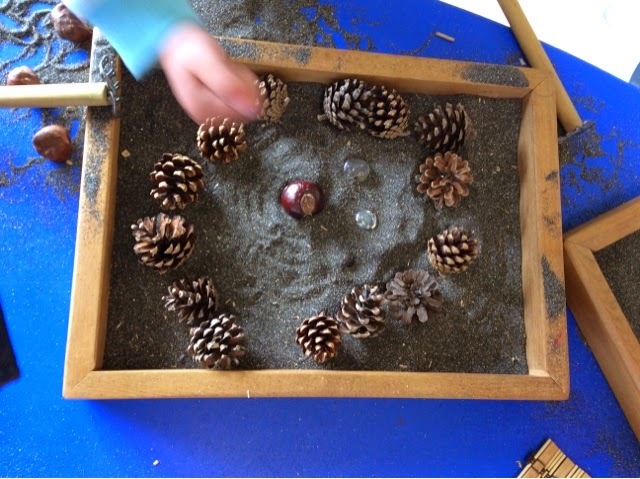 Lets see if children continue to transfer this art from table top to their play in different areas of the Kindergarten. 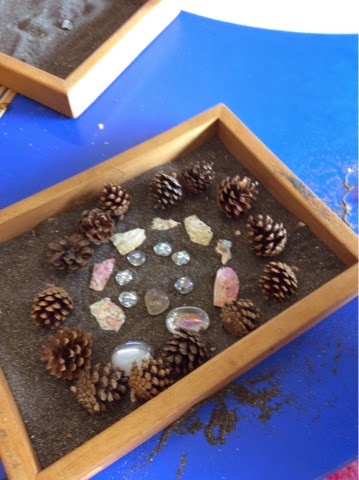 We also wonder if some children would be interested in planning forward and sharing some ideas for different natural resources that could be used for their ephemeral art. 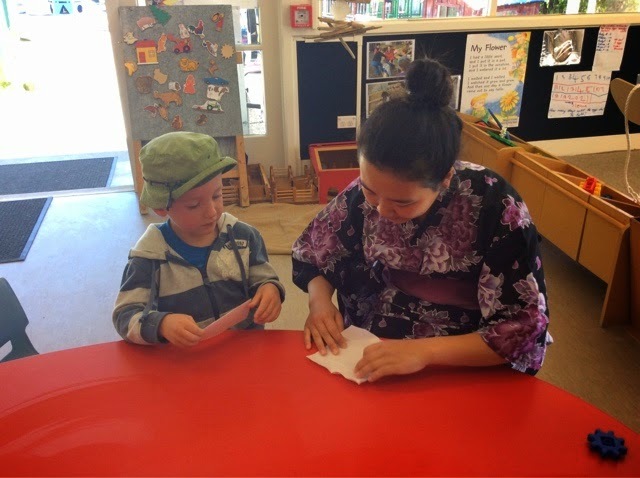 Maybe there might be some at home, at Kindergarten or even in the wider community that we can collect on an excursion.